BY PASSION: Outreach educator and founder of “90-north,” a traveling enrichment program series that introduces students to topics relating to the Arctic and sub-Arctic regions, covering all disciplines from anthropology to zoology. BY PROFESSION: Arctic Editor for The Polar Times (2007-2014); Contributor and UN liaison for The Arctic Institute | Center for Circumpolar Security Studies; Contributing editor for The Explorers Journal; Arctic Editor and contributing author to Indigenous Policy – journal of the Indigenous Studies Network, and to World Ecology Report – Promoting Health and Environmental Literacy; and Contributing writer and SME for Polar Bears International. BY OBSESSION: United Nations Main Representative for the World Federation of Ukrainian Women’s Organizations in consultative status with the Department of Public Information; Senior Editor of the UN Climate Caucus Framework for Action Report; Participant at annual UN Permanent Forum on Indigenous Issues conferences. Primary focus of work addresses the impacts of climate and societal change on the indigenous peoples of the Far North. BY ADDICTION: Environmental advocate and part-time explorer/adventurer with keen interests in the fauna, flora, and local native cultures of the Arctic. 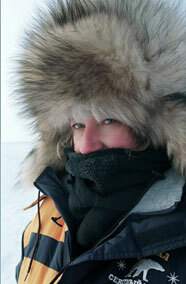 14th woman, and first Ukrainian woman, to reach the geographic North Pole via Svalbard and Borneo Ice Base (2003). She has been spotted inside Saami tents above the Arctic Circle, has been seen dog-sledding near Longyearbyen, Svalbard and on the glaciers of Iceland, and she has successfully avoided collisions with trees whilst racing through the forests of Jukkasjärvi in Arctic Sweden on a reindeer sled. BY AFFILIATION: Visiting Arctic Speaker for ARCUS; Founder of the Polar Film Festival; Director at the Wilderness Research Foundation; and presenter at the Will Steger International Institute of Climate Change Education.